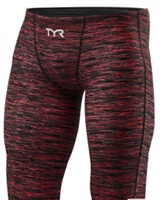 TYR have designed these racing jammers to help you achieve your best performance in the pool, the Thresher Baja swimsuits showcase a combination of new innovative features. The FINA approved Thresher racing jammers have hydrophobic fibres woven into the suit, which maximizes performance by reducing drag in the water. The jammers material increases the speed and efficiency of every swimmer, the Thresher’s advanced level of compression helps to maximize core stabilization and support. In addition, flatlock seams conform to the athlete’s body, providing a durable, 360-degree stretch, and uninhibited mobility. These TYR jammers are lined and have an internal drawstring to get the best fit. Unique Pattern that looks great in the water. TYR have designed this racing swimsuit to help you achieve your best swim, the Thresher Baja showcases a combination of new innovative features. The Thresher race suit is embedded with hydrophobic fibres, which maximizes performance by reducing drag in the water. The swimsuits material increases the speed and efficiency of every swimmer, the Thresher’s advanced level of compression helps to maximize core stabilization and support. The Open racerback design gives ease of movement, the straps provide a secure fit without cutting into your shoulders. The Avictor is TYR’s fastest, most innovative technical suit. FINA approved suit maximizes performance. Hydrosphere technology works in harmony with the swimmers natural abilities in order to optimize body positioning in the water. Ground breaking technology causes water to surround the fabric of the suit, creating a visible hydrospheric affect. as a result of maximized positioning, drag is reduced and speed and efficiency are boosted. Snug fit at all times. High-tech, super flex bonding allows fully bonded seams to conform to the swimmers body and provide a durable, 360 degree stretch. Result is a precisely fitted, ultra compressive suit that maximises core stabilisation and overall support while allowing 100% natural movement and ability.